The falling cost of renewables is not news to those who have paid attention to analysis from green-focused think tanks, or groups like Bloomberg New Energy Finance. 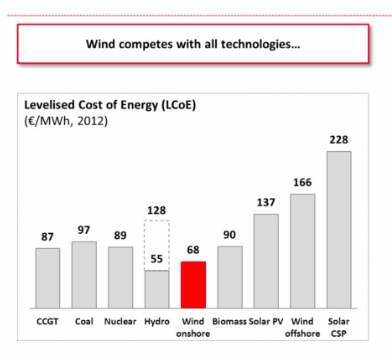 But it is when a major European utility, with equal exposure to fossil fuels, wind, and hydro, says that onshore wind is the cheapest of any new utility scale technology. That is the assessment of Portugal’s EDP, which has around 24GW of generation, of which around 8.7GW is in onshore wind. In a recent presentation to analysts, EDP’s head of renewables Joao Manso Neto presented this slide below, which shows that the levellised cost of electricity of onshore win in Europe is 20 per cent cheaper than gas and one third cheaper than coal. (The figure assumes 25 per cent wind capacity factor). These estimates are for Europe, but Neto suggested the cost difference is even greater in the US, where recent contracts have been struck between $20/MWh and $40/MWh. That’s despite the so-called shale gas boom, which brought down costs of gas-fired generation for a short period, but still cannot compete with wind. “It is clear, more and more, that our product (wind energy) is good, not just because it is green, but because it is cheaper,” Neto told the analysts. (You can see the presentation here). He said wind energy is also cheaper than gas in key emerging markets such as Brazil, South Africa, Mexico, and major Asian markets. He might have been referring to the likes of former Queensland Treasurer Keith De Lacy, who in the front page lead for The Australian today said renewables had “no place in a modern society”. And he might have been referring to people like Institute of Public Affairs’ Alan Moran, who insists that that wind energy is “three times” the cost of coal. Neto says “the less educated” typically refer to the spot price, but this only reflects market dynamics and the level of supply and demand, not the cost of the technology. New build coal is also “three times the market price”. In Australia, and other similar countries, incumbent generators and those that seek to protect them, are simply trying to stop the introduction of new generation – be it green or brown or black – because it will make older and less efficient coal and gas generator uneconomic. The Minerals Council of Australia makes this clear in its submission to have the renewable energy target dumped. “Wind is not only competitive, it is prepared to compete,” Neto says. But to do that, it would need an equal playing field, such as the removal of the fossil fuel subsidies that add to half a trillion dollars worldwide. If the world is to decarbonise, and accelerate the withdrawal of polluting power stations, then wind will clearly be a winner. 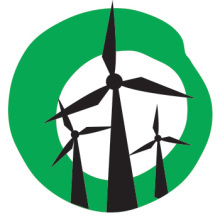 Bloomberg New Energy Finance said in a note to clients that statistics already show that onshore wind can have a lower cost than gas or coal. The cost of onshore wind is in the range €42–€78/MWh, compered to CCGT (base load gas) at €62–€98/MWh and coal at €75–€90/MWh. Says it all really. It’s sad that people like the Queensland Treas, holding such an important portfolio remain so ignorant of the facts. Given that Queensland relies so much on coal, it’s not surprising he studiously avoids contradictory information. But don’t discount shortsighted ideology as his main driver. Nothing Alan Moran says is very surprising, he has been a consistent denialist for years. There is no way he will change his tune because it would mean his main source of employment would disappear. Wind Generation has now got so cheap you don’t need REC, RET they will just stand on their own feet I don’t know what is all the fuss is about then you should all be telling Warbuton to get rid of it all not bitching about it. The problem with Wind Energy (and other Renewables (except Hydro)) is that idealists keep over selling them without understanding how the industry actually works. Immediately Despatchable Plant consists basically of Hydro Turbines and Gas Turbine – these can be switched on and off at a moments notice. Hydro is the best possible source as it meets all criteria – despatchable, clean, renewable. Non-Despatchable Plant consists of Wind Generation, Wave Generation, Solar Generation – their operation is intermittent and unpredictable. The third category is Despatchable Plant (DP) with long run-up times – basically these are thermal plants operating by Superheating Steam and consists of Nuclear Generation, Coal Generation, Oil fired Generation. Imagine the National Grid with a certain demand, say 10GW, and 8 GW of wind. Typically the Wind generation will be 2GW but it could be 0 and it could be 8, so the Operator of the grid has turn the IDP on and off to balance the wind energy going up and down. So in a country like mine with 2% hydro, we would have to build 8 GW of Gas Generation to match the 8 GW of Hydro, which increases the investment cost and 75% of our electricity would have to be generated by Gas, with only 25% coming form Wind. In addition, Wind Turbines tend to be built in “remote” windswept areas so a new TRansmission Network must be built to accomodate the maximum available 8GW but we will only ever get the 25% WCF ouput of 2GW. So – the cost of large scale wind generation is simply staggering unless you happen to have a matching capacity of IDP (Hydro and Gas). It is worth looking at Germany where they have lots of coal and nuclear (DP), and lots of Wind and Solar (NDP). The cost of electrical energy on the wholesale market has fallen from €75 per MWhr to €30 per MWhr; but the price paid by the householder has risen from €130 per MWhr to €285 per MWhr. This illustrates that although the running costs of wind are very low (no fuel); the overall cost can be ridiculously high.